Metal Hammer have named Mastodon’s Emperor Of Sand their album of the year for 2017. It’s topped the Critics’ Poll of the year’s finest albums, with the top 100 list available in the brand new edition of the magazine, which is on sale now. Dailor also praises the current metal scene and says there’s exciting music coming out around the world. He continues: “I think that things have gotten a little more extreme but also a little more avant-garde, with Myrkur and Code Orange and a number of others. 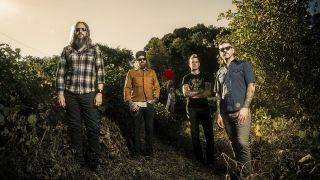 Last week, Mastodon received Grammy nominations in the Best Rock Album category for Emperor Of Sand and in the Best Metal Performance shortlist for their track Sultan’s Curse. The band marked the announcement by releasing a film documenting how they made Emperor Of Sand. The new issue of Metal Hammer – featuring the top 100 metal albums of the year – is on sale now and also includes cover stars Machine Head, along with Avenged Sevenfold, Asking Alexandria, Code Orange, Arch Enemy and much, much more.